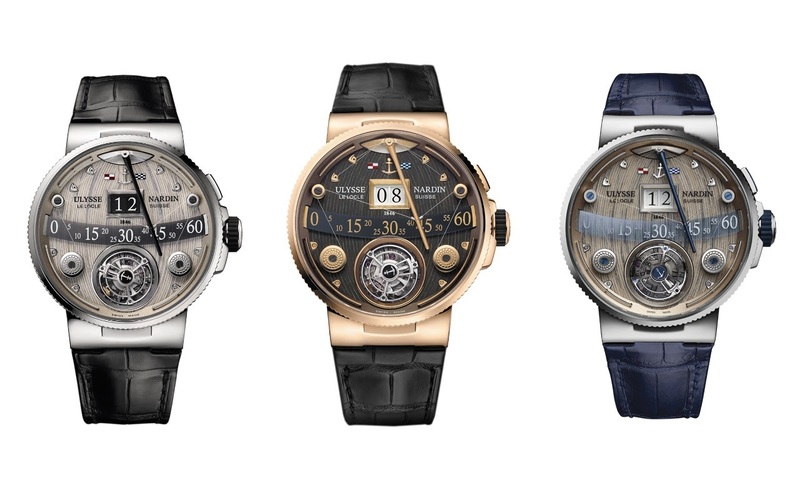 Ulysse Nardin Marine Grand Deck White Gold, Platinum and Rose Gold. Some thoughts. A family picture of the Marine Grand Deck, which first came in white gold, in 2016, then in platinum and rose gold. All these versions are limited to 18 pieces. The dial is hand crafted wood marquetry, which evokes the... deck of a ship, the retrograde minutes are activated through a boom, which is controlled by 4 pulleys driving the nanowire, the minute hand is shaped like a mast. The minutes hand goes back to its base ( zero ) slowly, at the contrary of what we are used to see with a " conventional retrograde mechanism. Indeed, it takes some good three seconds to go jump back to zero, which is quite fascinating. The typical Marine case, 44 mm big, gives the watch its own personality. Some will like, others will prefer conventional lugs, a matter of taste. It is quite thick, though. Other than that, you have a jumping hour, and a flying tourbillon. The movement, UN 630 is manual winding, beats at 21, 600 alternances per hour, and offers a power reserve of 48 hours. Did you know that Christophe Claret collaborated to the development of that watch? That being said, let's see this pure horological madness, with a side by side picture of the three versions. Among these three, I would hesitate a lot between the white gold, more dynamic, maybe, with these touches of Blue, and the platinum, because I have a soft spot for this metal. While I am fascinated by this " opus ", I would still favor the Freak / Innovision, the Sonata, some automatons / minute repeaters such as the Genghis Kan, or the Astronomical set, especially the Tellurium. 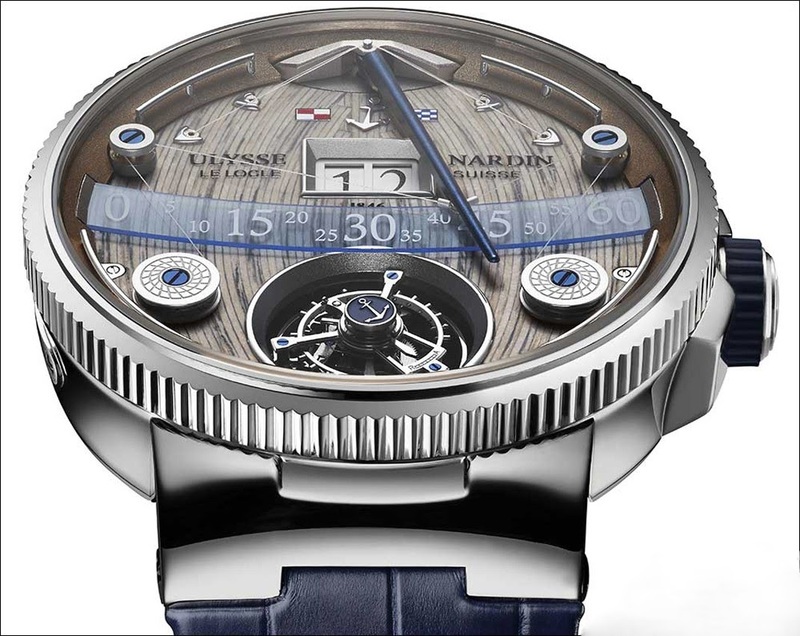 Still, what is important with the Marine Grand Deck is that it " signs " the return of Ulysse Nardin after a few years of consolidation. Now, we want, we expect more and more from a brand which is really apart, in the horological world. A group shot would be a dream, indeed. Very cool, indeed. I can't wait to see it in the flesh. Same here. It is hard to decide between these 2.